In addition to Cleasby’s comprehensive Complete Warning Line System for rooftop fall prevention, separate pieces can be purchased to expand your system or to accommodate smaller set ups. The full system includes four stanchions and bases, but you can also order separately both the pole and base here, item W00075. Regardless of how big or small of a space that you need to set up a perimeter alert, the Cleasby system has got you covered! Fall prevention in roofing is one of the highest priority in regards to safety equipment and procedure. It is not uncommon that workers become preoccupied during all stages of a roofing job, as the labor intensive tasks require complete focus and attention to detail. The result of not being aware of your surroundings when off the ground could lead to unthinkable tragedy. A fall prevention warning line system snaps worker focus back to the actual work environment, and notifies them when they have approached the perimeter of the roof. Although simple by nature, and not a fall arrest system – This alert system functions very well on both residential and commercial jobs. 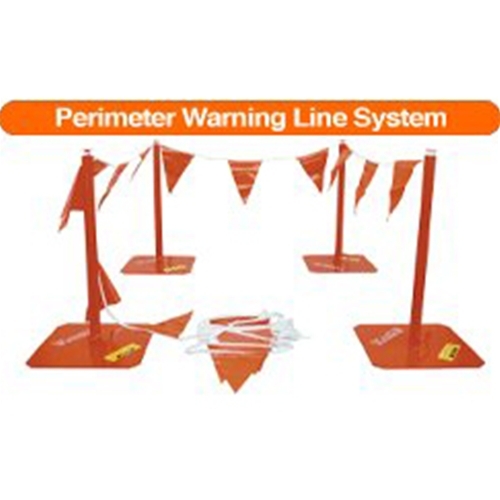 To accommodate crew sizes and job sites of all sizes, Cleasby has a great mix and match platform that includes the Complete Warning Line System, as well as each individual part sold separately. Add to the full system, which already includes 4 poles, 4 bases and 100 foot of pennant line – Or order only the quantities you need for smaller areas. Browse the entire Cleasby Line up today, including safety equipment and all your traditional roofing supplies. Cleasby has been providing trusted solutions for the roofing industry for over 60 years, focusing on quality and technical expertise every step of the way. Call us at Intech Equipment and Supply today to place your order for the fall prevention pole and base combination by Cleasby.